This Starter Pack and its films will help young beginners enjoy their first steps in Primary German and finding out about everyday life in Germany. Here is film 9, "Wie ist das Wetter", designed to be shown in 4 sections. - shows "what is the weather like today"
Just enter your email to download a sample chapter from the Teacher's Manual. It's full of practical teaching ideas using the sample movie about 'weather'. Each chapter in Pack 1's Teacher's Manual is full of suggested activities to develop the language and explore the culture shown in the films. 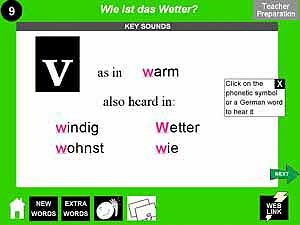 Electronic and printable Flashcards to get to know the sounds of the new words, explore patterns and play games.... with native speaker voice and optional text. Add interactive activities with the Interactive CD-ROM 1 to use as part of your scheme. (optional extra). New language is introduced on screen by native-speaker German children, specially filmed in Germany. 1 hour 25 mins of film in 16 sections! Each topic has suggested cross-curricular activities, including writing sumple picture stories with "talking word-processors" like Story Maker 2.1, and class projects in music, PE and exchanging information with a partner school. Teacher' Manual suggests games and activities for your lesson-planning. Fits well with the KS2 Modern Languages Framework, and the "Languages Ladder" acreditation scheme. Matchs the QCA KS2 German Scheme of Work. on the theme of "me and you"..
3 Wie geht's? - How are you? 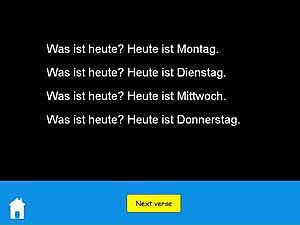 4 Wie heißt du? - What's your name? 6 Wie alt bist du? - How old are you? 7 Wo wohnst du? - Where do you live? 9 Wie ist das Wetter? - What's the weather like? 14 Hast du ein Haustier? - Have you got a pet? 15 Fröhliche Weihnachten! - Happy Christmas! Some schools use Early Start German packs 1 and 2 for a German "taster" within their school's 4-year MFL scheme of work. NEW! Download links to the QCA Scheme of Work and KS2 Framework Learning Objectives HERE, to help save you time in documenting your lesson planning. the same films, Teacher's Manual and e-flashcards. 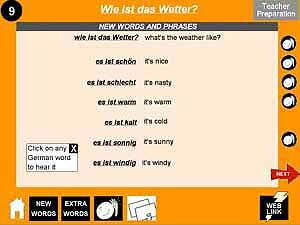 Each / Network licence now include FREE first year's access to German 1 ONLINE (a great help for lesson planning at home or away from the school site). ... then buy MORE PACKS for your colleagues at 40% off!